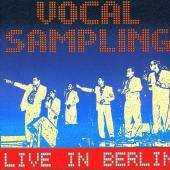 Vocal Sampling - "Live in Berlin"
Recorded at Berlin´s Summer Festival ‚Heimatklänge 1990 - 2Beat! Apartheid' . Never before has there been an international release of the Kizomba music original to Angola. Kizomba - joyous Carnival feeling - as played by the longest existing Angolan band ORQESTRA OS JOVENS do Prenda is a new combination of different Angolan rhythms and styles according to the national culture.